As 2016 comes to the end of its year and a brand new year of 2017 will face us soon, I wanted to review how much we have accomplished by working together. As more of our citizens have become familiar with our Cherokee Culture, including the seven directions; they have become stronger in their minds, bodies and spirits. This has led to a new sense of strength for our people and our Nation. We are becoming stronger as a Nation and as a people. I have watched with great love and pride as I see our young people and their children starting to walk the Red Road. I also notice the sense of pride and of knowing who they are and where they belong. For most of them, it has become a great honor to walk between the two fires, the Cherokee road and the White world, and many are still learning that delicate balancing act. For all of you who ask, “Where are we concerning Federal Recognition?” My response is, ‘What have you done to help?’ The majority of our citizens live within driving distance of our Tribal Headquarters. Do not expect 25 to carry the weight for 15,000. Do what you can to help. We are moving forward in the federal recognition process and ask all of our citizens to be involved in that process by supporting our efforts financially. We have always had a few that support our Nation every month and we are grateful for that because that support has helped to pay our monthly bills. However, I believe that if the rest of our citizens would just donate a few dollars or even $1 per family citizen every month, we can continue to afford the rigorous and expensive OFA/BIA* process. In 2015, that process involved buying newer and more updated computers and paying for special software to comply with OFA/BIA* regulations and forms. We needed to upload over 15,000 files and make sure we had supporting documents for all of them. As a result, we also had higher utilities to support our tribal volunteers that would stay overnight or all week and weekends to work on those files. Most of them had full time jobs and took vacation hours just to help out. Also several repair and update projects on the buildings and grounds have been needed to be completed and I am personally grateful to everyone who has given their precious time, physical and mental efforts and funds to complete most of the projects on our list. It is a HUGE LIST of necessary projects and repairs, and some still require completion. We have survived yet another year with the loss of many of our beloved citizens and elders and we have had to move forward without their wisdom, friendship, and valuable guidance. We must use the lessons they taught us wisely and not let our people down. As a reminder, please remember: WE HAVE SURVIVED OVER 500 YEARS OF: massacres, exile and hiding to survive. We were forced to deny our heritage, were forced onto reservations, and endured broken treaties. Our children were kidnapped and locked into boarding schools, and our Nation suffered smallpox infected blankets, poisoned rations, and religious persecution. Now, in the 21st Century we have brothers and sisters fighting alcohol poisoning, drug addictions, domestic violence, prison and hazardous waste. Just to name a few. However; WE ARE STILL HERE and WE WILL ALSO SURVIVE tasks that the Office of Federal Acknowledgement (OFA) /Bureau of Native American Affairs (BIA)* have put before us. I CONTINUE TO PRAY FOR OUR SUCCESSFUL FUTURE: Creator, we are grateful for our lives and the breath of life each day. We are grateful for your guidance and for sending others to help us find the correct paths to travel. We thank you, Grandfather, for the opportunity to do better with your help. Thank you Grandfather for giving us this chance to do better from this point forward and to honor all those that have gone before. Thank you for our health and stamina. Thank you for allowing us to lift each other up and congratulate each other on our very survival. Grandfather, teach us to be quick to praise and slow to criticize. Help us to see and consider our brothers and sisters rights to their attitudes and beliefs even if we do not agree. Grandfather, help us to teach all our children and grandchildren how to walk the Red Road and to honor all our relations, not just the two legged but the winged ones, the multi-legged, the slithers and the swimmers, we are grateful. Remind us and aid us to watch out for the tricksters that come to take what does not belong to them. Above all, Grandfather, let us learn and understand that all things are possible if we unite and work together. As long as we all row in the same direction, we will get there a lot faster. We are grateful for all things. IT IS OUR TIME NOW!!! I will be traveling to Washington D.C. several times as required during this quest for federal recognition. Much more news to come. Remember, Northern Cherokee Nation Citizen’s, this is for all the marbles, folks. About six years ago after the “last election,” we started a new fight for federal recognition. There was a behind-the-scenes effort to convince the B.I.A. to change the rules for recognition. The new rules will be issued about March 1st 2015. As we all know, the old rules were designed to prevent any tribes from achieving recognition unless they had a war chest in the million and the influence of dozens of legislators. Even then, their efforts could be and were thwarted by any federalized tribe that objected. One tribe in Connecticut fought for 20 years and spent millions of dollars and still lost. Northern Cherokee Nation are now enlisting the help of a bipartisan coalition of senators, congressmen, and even members of the justice department to aid us in our fight. obviously been an expensive and very cruel joke. However, the feds appear to be sincere. At this time, we have faith in their efforts. The next few months will be the most exciting time in our history. MAKE SMOKE AND SEND UP PRAYERS TO CREATOR. PS: A note from Busy Red Bird. As tribal citizens, it is your responsibility to inform the office if you have - changed your name, address, phone numbers, and e-mail info. Your files MUST be current. Go to the contact us from and send your info in! Please notify your family members to do the same. POW WOW TIME IS AT HAND! POW WOW time is at hand. A time to see old friends and make new ones. A sure sign things are getting a little better is we have more and more citizens and friends coming from further and further away. Many are coming in from California, Oregon, Colorado, Hawaii, Oklahoma and Texas just to name a few places. This makes my heart happy. Here is the latest on the federal recognition revisions. On the 3rd and 5th of September, I took part in two teleconferences with the Bureau of Indian Affairs (BIA) with both lasting over three hours. The BIA no longer wants our questions, they want our answers. What changes do we want? This kinder, gentler BIA is hard to get used to. Just a few years ago they would have hung up on me. The time to suggest changes ends on September 30th. The Northern Cherokee Nation has submitted both oral and written comments. The BIA will take 30-60 days to put the new rules into law, at which time many of us will apply for our federal recognition. At that time, we will need the help of every tribal citizen. We have legislators from top to bottom waiting for our call. Then the work begins. We will be putting in hundreds of man hours and burning up hundreds of pounds of paper. Even with all the new rule changes, this is still a long, hard and expensive process. We will face many obstacles, and frustrations. As always, WE WON'T QUIT! We have fought over 160 years for this. We will be fulfilling a set of old prophecies. We will always maintain our culture, language and ceremony but this will be the single most important thing as a Nation we will ever do. As a Nation , we must prepare ourselves for this task. This opportunity will never come again and many native groups will not be successful. This project will call for many sacrifices from all of us. I encourage all of you to come to Pow Wow and/or support your Nation in any way you can. NORTHERN CHEROKEE PEOPLE, this is for you. This is for all the marbles. This will determine how history remembers us. Our children's children's children are already looking back on us. Let's make them proud. Cherokee Proud. Remember, even if you can't attend the upcoming Homecoming Pow Wow and Cultural Gathering, you can still donate your dollars of support. We still have lots of food to purchase and there are many expenses that go with putting on an event this size. Electric, water, advertising, printing flyers and so much more are included in hosting the Pow Wow above the regular day-to-day expenses. We are working very hard to complete the renovations on the office and grounds so they will be ready for your Homecoming Pow Wow and Cultural Gathering, so let's everyone, especially those who will not be able to attend, send your donations in. We have Memorial space for sale and advertising space available (August 15th deadline). And remember, we have PayPay for your convenience. So many good things are happening. Let's all work together . We are Proud Northern Cherokee Nation Citizens! Time for the Northern Cherokee Nation's annual Homecoming Pow Wow and Cultural Gathering. "This is a high time for our citizens," stated Chief Grey Elk. The Pow Wow, scheduled for Friday through Sunday, September 19-21, is free of charge and open to the public. Held at the Northern Cherokee Nation's Tribal Complex located five miles east of Clinton, Missouri, on Highway 7, the event will feature Native American dancers, artists, and numerous vendors with Native American exhibitions. Special guests for the Pow Wow include Native Spirit from Missouri as the Head Drum, Dr. David Flying with Eagles Bevette from Hawaii as the Head Man Dancer (photo at left); Karlee Little Hawk Neisen from Missouri as the Head Lady Dancer, and David Wild Horse Long, also from Hawaii, as the Head Gourd Dancer. The Grand Entry is scheduled to take place on Saturday, September 20, at 2 p.m. An auction, with donated items from around the United States, is scheduled for earlier on Saturday beginning at 10:30 a.m. Those wishing to contribute items for the auction are welcome to bring them to the Tribal Complex on Friday evening and Saturday morning of the Pow Wow weekend. All proceeds from the auction will go to benefit projects for the Northern Cherokee Nation. Indian tacos, frybread, soft drinks, and many other food items will be available during the Pow Wow weekend. The Homecoming Pow Wow and Cultural Gathering planning committee expresses appreciation for all who have contributed to the planning of the weekend, and invite all to come enjoy the celebration and Native American experience. Good News is in the Making! Osiyo, Tribal Family and Friends. Just as our corn and gourds are growing during this summer season, our Northern Cherokee Nation is growing and evolving each and every day. On July 1, Council Member and Spiritual Advisor to the Chief Ed Beesley and I had the honor of representing the citizens at a meeting on July 1 in Marksville, Louisiana, with Larry Roberts from the Bureau of Indian Affairs. This was our second meeting with the BIA as Deputy Chief Starr Tawny Eagle and I visited with the BIA several months ago in Phoenix, Arizona. These are important meetings as we explore the rules and regulations of Federal recognition of Native Americans. This is going to be a daunting task to obtain Federal recognition. We are currently in what is called the “comment” period which will continue until August 16. On August 26, the BIA will announce new regulations to the public. At that time, formal applications from the Federal government can begin. A special wado to all of the tribal citizens who helped sponsor travel for this meeting with the BIA. Your financial investment is likened to planting seeds and we await Creator to bless our harvest. There will need to be other regional trips and meetings throughout the coming months with the BIA and legislators about tribal recognition. Please continue to support the Northern Cherokee Nation with your donations as that will be vital for us obtaining Federal recognition. PayPal has become a useful and safe tool for sharing your support with the Northern Cherokee Nation. Wado to those who have used it…and wado to those who will use it soon. Check back on our website often as I use this as a way to communicate this journey with our citizens and friends. As I was making the 4 ½ hour drive home from our December meeting, I was thinking about how far we have been able to come in just the last year, and how grateful I am to our Creator to allow me to be a part of this great journey. One short year ago, we had very few citizens coming to our tribal meetings and we did not even have enough money to pay the bills. Massive repairs were needed to our tribal headquarters and I was not sure if the few citizens we had, that donated to our necessary tribal finances, would even be able to continue doing so because of the economy. Just a year ago last December, our chances of Federal Recognition seemed to be a fairy tale we told to ourselves to keep our spirits up. One year ago, things appeared bleak for our Northern Cherokee family. What a difference one year can make in the lives of so many. In January, the new Assistant Secretary for Indian Affairs, Office of Regulatory Affairs and Collaborative Action, U.S. Department of the Interior, Kevin Washburn, (A Chickasaw citizen from Oklahoma), authored an 81-page proposal to change and shorten Federal Recognition requirements for the very first time. This has changed the game entirely for the 236+ Nations that have fought for recognition for over 100 years. And, as you have seen, after asking our Creator for guidance and blessings, the Chief and I went on the trail. We were determined to make sure our people received proper consideration. At the same time, I asked and received a great gift. Our citizens started stepping up, showing pride and claiming their Sovereign Nation heritage. I am so proud and grateful that you have and continue to do so. Not only did our citizens start claiming their heritage, but more and more citizens became involved with our Nation, both personally and financially; and you can see the results. Our tribal headquarters now has new plumbing, including two new restrooms, new paint, newly refinished floors, some new insulation, new furniture and more on the way, repairs on the outside and our new Nation Seal on proud display on the front of our building. We also have new heaters, copper pipe to install them and a supply of propane to see us through the winter. We are members of the local Chamber of Commerce and our participation in the 2013 & 2014 Days of Glory Parade has yielded two trophies, one trophy for each year. We have also been blessed with being able to contribute to the persons in Clinton that have been less fortunate than ourselves. Our citizens have developed a new strength, pride and honor and show it every day to everyone who sees us. I am grateful, to everyone who has stepped up, and to our Creator that has guided us to this new path, a future of great possibilities. Please, let us all pause and reflect on all the changes that everyone helped to achieve. Let us now look forward to a new year, new opportunities and an exciting future for our Nation. As we do so, let us remember those who do not have a tribal home and family. For those who do not have enough to eat, a warm place to stay, or enough clothes for their families, let us be grateful for what we have to our Creator and pledge to continue to help our Nation move forward. Now, more than ever in our history, we need our citizens to stay strong, active and ready to help. I know we can count on you because you have already proven how much we can accomplish when we work together. Keep up the good work and here is to our future, the best and brightest ever because of you, because you are The Northern Cherokee Nation. Wah doe, Starr Tawny Eagle Mayo, Northern Cherokee and proud to be your Deputy Chief. Wado to all that came to the May meeting. It was a very productive council. We have decided because of liability, trash and vandalism, we will be gating the tribal grounds. Jane Hicks has explained to the Clinton School District that they can no longer be using our drive and front of building in the coming year, and they understood completely. It is a shame that because of a few, others are punished. With that said, we are asking for you to support our efforts to purchase gates, fencing, post, and other supplies. Pay Pal is available for your generous donations, just go to our webpage www.northerncherokeenation.com. Pay Pal is located under the CONTACT tab. We are also looking for donations for our auction we will be having at the Pow Wow. Old farm implements, Native American collectibles, and artifacts, or things that you no longer need in the china closet. PLEASE no clothes or damaged items. As we receive your items, we will post pictures on the web page. Remember this is our major fundraiser for your Nation. The money we raise goes towards the building improvements, as many of you have seen when you attend the monthly council meetings. 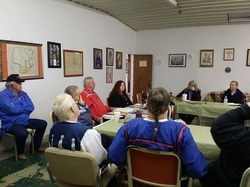 Next meeting is June 14th at the Tribal Headquarters located at 578 E, Hwy 7, Clinton, Missouri, 64735. Tribal citizens, Mike & Linda Ford, have volunteered to help purchase Blue Flame Propane heaters for the council room and office. We will be contacting the local propane companies in the Clinton area to get estimates for installation. As soon as we have the estimates I will let you know, as help will be needed. This will be a big help in the fall and winter months not having to run electric heaters to keep the pipes in the building from freezing, and paying a HUGE electric bill. My main focus this year is to present an updated and fresh appearance to our Tribal Headquarters. Your help is needed for that to happen. Jane Hicks, Rita Bow, Cindy Linchey and myself have been working when we can to paint, clean and update the office. As we all live miles away, this is taking a lot longer than I planned. Of course, we all have full-time jobs also. So anyone that would like to help, please call me at 573-885-1070. Oh, did I mention, a strong man would be useful too. These cleaning and refreshing efforts are, in part, to show the Federal Government (B.I.A.) that we have a working tribal government and that all our files and records are in order. Remember that many things are happening in the Indian world and it pays to be ready. I want to thank tribal citizens Buck and Charley Hollomon for their meticulous care of our tribal grounds. I know that no matter what, the grass is mowed and the grounds look awesome! Their dedication and time to NCN is greatly appreciated. Charley, thank you for working on the records and getting them in order I know that we still have a ways to go but we are getting closer and closer to finishing a thankless job. Remember, we still are looking for your Cherokee family stories to share on our web site. Just send a copy to the Chief for review and then we can share with the world. These stories, good or bad, are what we are about. It’s our history, our way of life. Remember what your parents, grandparents, aunt, uncles, and for some, great-grandparents, told you as you were growing up. I am sure some must remember Cherokee foods that were served and herbs that were used for medicinal remedies. Some of those same herbs are being used today with great results. Include pictures if you would like. A final word to all Citizens of the Northern Cherokee Nation and our generous friends, in order to continue to grow and improve our headquarters, your most generous donations are needed. Please send in your donations to the Northern Cherokee Nation or go to www.northerncherokeenation.com and donate using PAY-PAY (under the CONTACT tab at the top of the website). PS. We are needing 14 (four-drawer) filing cabinets as ours at the Tribal Headquarters are in terrible shape. To purchase them brand new at Staples, they are about $200 each. Beige would be the preferred color. This would make a great fundraising project if someone would like to tackle it. Thanks for your consideration. Give me a call to brainstorm. 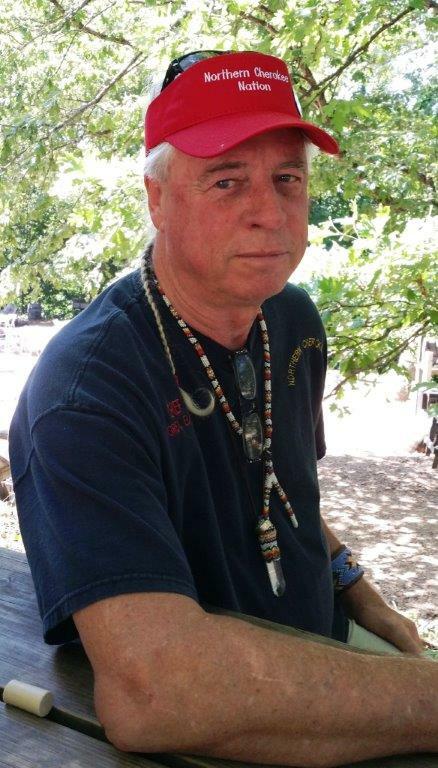 On April 19, 2014, the Northern Cherokee Nation was invited to participate in the one year anniversary of the Blue Stream Team, victory over the Missouri Department of Natural Resources (see full story on this site). So, one year later, the Northern Cherokee Nation was invited to celebrate this important event, dress out in our best regalia, and show off. We displayed some of your arts and crafts, and preformed an eagle feather ceremony for one of our honored veterans. Many humble wado's to Abraham Clark for his service. We were then honored by the accolades of several guest speakers and the unveiling of a beautiful stone plaque with the Northern Cherokee seal hand painted by Janice White of the Stream Team. This marker was then set in concrete to signify this event forever. The Northern Cherokee Nation wishes to express its appreciation for this great honor. Blue Springs Creek is a pristine area, covered in Native artifacts and numerous grave sites. We were very happy to be given the chance to help preserve this area for future generations. Thank you to all who attended the Northern Cherokee Nation Council meeting on May 17. We know that many of you, including the councilmembers, drive long distances to attend and support your tribe. We want to send a big Wado to the special guests and to Councilman Mike Ford and wife, Linda, who despite many health issues, were able to attend. Thanks for sharing good food and good company. Look forward to seeing you all on June 14th as we continue planning for the fall Pow Wow. The following inter tribal moon ceremony was offered at the 2011 Pow Wow of the Northern Cherokee Nation at headquarters in Missouri, America. Although the basic outline below can be used with any inter-tribal wimyn’s gathering, the moon sign or theme Intention would necessarily change. Also of great value is the incorporation of high council wimyn, and a female elder, as you see below along with the blessing of the Chief of the Tribe. It is ideal, of course, if the ceremony can be held out of doors and with sacred fire for smudging. The leader is hopefully experienced with leading wimyn’s circles and has a heart for the people. It requires sensitivity to who is present and from what tribes and what will allow the people to feel mutual respect. The inclusive energy invites the wimyn of different ages and stages and ways and needs to find their voice and open their hearts to share and create an atmosphere of personal and collective empowerment and greater self knowing. It is different every time. But it is always sacred and is meant to have ritual, sacred circle, compassion, authenticity and as much transparency as the soul can handle. The basis of the ceremony is the use of the four elements and respect for differences allowing Wisdom to come forth which builds unity - the one world family. It is ideal to have a scribe who can preserve the collective wisdom and present it back to the larger tribal circles. Not all wisdom has words but what can be spoken can be shared in writing. This is an example. Opening Ritual - with smudge stick or cedar or anointing oil welcome the wimyn as below. Use their Indian name whenever possible. After they are smudged or anointed guide them to a place for sitting in clockwise fashion around the fire. May you find your voice to speak your truth. Or, Welcome ___________. We were once a Nation of many Tribes and now we are a Tribe of Many Nations. Welcome to each one and the Tribe or Clan and families you represent. We are varied. We come from varied traditions and experiences and visions. It is not the intention to offend any one or any tradition. We are all wimyn and come with a rich herstory of ways that are dear to us. Wimyn have been gathering around the new and full moon as the earliest of all wimyn ceremonies. They gathered to celebrate, to mark passages, to mark the seasons, to prepare for great change, to build and share their wisdom and to have fun. This moon circle under the strong Taurean moon is to share our collective feminine wisdom and power to bring forth greater Peace. Peace with one another. Peace in our homes. Peace in our tribes and the world. Peace with our own soul self. First Spiral: I am __________, daughter of _________, and my people are __________. Let’s begin to build a sense of togetherness with a song: Cherokee Morning Blessing Song. Third Spiral: Using bowl of water and feather, bless the altar with a one word or phrase response to: What is an essential quality of Peace? What is needed to stand in good relations with all people? Forth Spiral: Using sage or lavender and rubbing in your hands and then dropping to the ground with a healing word or phrase to: What is needed to restore broken Peace? May your people live in Peace with our people. May your people live well and prosper. May the children remember the ways of the elders. May the elders never tire of the Visions of the children. Closing Spiral: Standing in circle going clockwise or the way of the sun each one to the next - I belong to you; You belong to me…. Recently both our Chief and Deputy Chief have posted messages (on file under the Chief's letter in the Newsletter tab at top) on current tribal affairs. Upon reflection, I thought it might be useful for me to add my observations and comments. I have been Speaker of the Council for over eight years now and during that time I have been witness to continual ups and downs in our affairs, with more downs than ups. I have seen our financial situation range from a low of almost certain foreclosure and loss of our tribal grounds at Clinton to a high of having our monthly expenses paid current. As we have often reminded you, the tribe receives no financial aid from any outside agency. We must rely exclusively on contributions from tribal members and whatever income we can generate from events such as our annual powwow. This is truly a “hand to mouth” existence and it puts tremendous stress on your tribal leaders. Over the years, I have seen our Chief, Grey Elk, more than once personally stave off tribal financial disaster. This was truly admirable and we owe him our sincere gratitude, but it not fair for us to expect that of him. I will tell you that your Chief and Deputy Chief are two of the most dedicated and competent persons I have seen in a long life of observing people. Their energy, commitment and genuine care about tribal affairs and the status of the tribe inspires me and makes me feel humble and that I need to do more for them and the tribe. There has been considerable discussion recently about our quest for federal recognition. That is an exciting possibility, however the process is very onerous and there is no guarantee that we will be successful. I certainly hope that we are ultimately granted federal recognition, but I think it is misguided and disingenuous to expect the floodgates of federal largess will then open and inundate us with a cornucopia of wonderful benefits. Rather, I see the greatest benefit of federal recognition as a formal, public admittance and acknowledgement by the federal government that we are indeed what we know and say we are; an authentic, genuine, legitimate tribe of Cherokee people. Our tribe is indeed fortunate to have such an able Chief and Deputy Chief together with dedicated Tribal Council members. But they are human and oftentimes they grow tired and become discouraged by the constant struggle with financial matters. They desperately need your support, moral, financial and psychological. 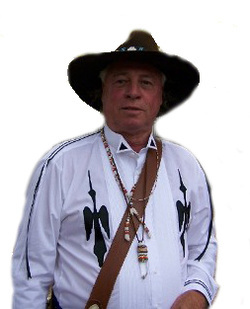 If your Cherokee heritage is truly important to you, get involved in tribal affairs. Commit to making a monthly financial contribution; even very modest amounts are helpful if they are made on a dependable and regular basis. Send emails or make phone calls to the Chief and Deputy Chief to encourage them and express your appreciation for their leadership. Make a concentrated effort to attend tribal council meetings as often as possible in addition to attending our special events. Missouri, celebrated her 80th birthday on Saturday, November 2, with family and friends from across the United States. 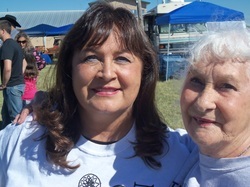 White Deer (on right in photo) is a special and dear elder loved by all tribal members. She is the mother of Councilmember Calm Spirit, Donna Wobbe (also photographed).